As an involved volunteer for the Web Analytics Association, I've been maintaining the official WAA Search Engine and several widgets you can use on your own site. 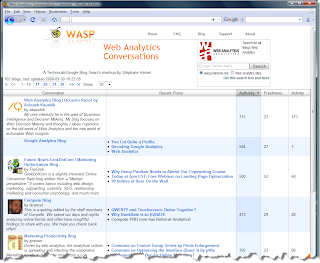 I also published a couple versions of the Web Analytics Conversations, a list of dozens of web analytics related blogs grouped into one master RSS feed. New blogers around the world are submitting their blogs for inclusion in this growing list. Something annoyed me in the fact of simply listing blogs. How can we easily identify top blogs? What IS a top blog anyway? Is it because of authority? Is it keeping it fresh and publishing often? What about quality of the posts? I've been working on a mashup of Technorati, Google Blog Search and other sources of information to create a dynamic tool that shows top web analytics blogs by Authority, Freshness and Activity. It's not ready for prime time yet, but click on the image below for a larger view. As you see, it's dead easy to see the top authorities in the field of web analytics, and what they are talking about. Base on the snapshot above, what else would you expect to see in this tool? But first, would you find it useful and use it? If you've done your Marketing 101, you will quickly see those metrics are very close to RFM (Recency, Frequency and Monetary value), the later being replaced by Authority. The tool shows the blog title, description, author and blog picture, recent posts and allows to sort by any of the 3 metrics. c) It's impossible to automate an engagement metric, you're crazy! I would love to hear your feedback about the sneak preview and how you would like to see the ranking.